The moment Masashi Kishimoto announced that he was going to end the manga this month, I was utterly in shock. I thought I was already mentally and emotionally prepared for it. When rumors circulated online about the impending conclusion of Naruto, I decided to ready myself just in case the gossips become true. But even after it was officially announced by Kishimoto himself, I was still doubtful. My inner otaku refused to believe it. I just couldn’t accept the fact that the story that I had been tailing for the past couple of years would finally end. No. I just simply couldn’t acknowledge it. But no matter how much I repudiated, the truth haunted me. And the moment I dreaded finally came. Chapters 699 and 700 were released simultaneously, signaling the inevitable end of my favorite manga. Upon reading 699, the emotions that I had been trying to repress from the past couple of weeks suddenly poured out. The previous chapters, which mainly depicted the struggle between Naruto and Sasuke, were just too much for me. The feelings I had when Sasuke finally acknowledged his defeat were beyond description. To be honest, I was actually upset with him when he declared a revolution against the Kage and the shinobi world. But putting into consideration all the miseries he had suffered, I couldn’t totally blame him for his actions. He was annoying, that is true. But I couldn’t just simply disregard the reasons why he chose to stay in darkness. And I was thankful to Naruto for saving his friend. 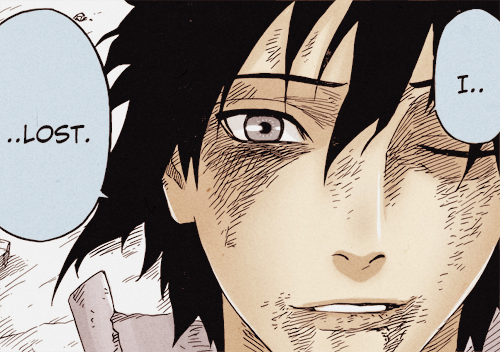 For chasing him and knocking him unconscious until Sasuke finally realized the path he was trying to take. So when I saw Sasuke flashing a genuine smile to Naruto, my heart just leapt for joy. The tears he spilled were so precious. He had never shown such emotions to anyone other than Naruto. Chapter 699, I believe, was a far more suitable ending to this manga than 700. In 699, Team 7 finally reunited, and when Sakura and Kakashi arrived at the Valley of the End. I felt like I was with them, too. That was one of the things I had been waiting for all these years—to see the four of them together again. The Infinite Tsukuyomi had been undone, and everyone was saved. 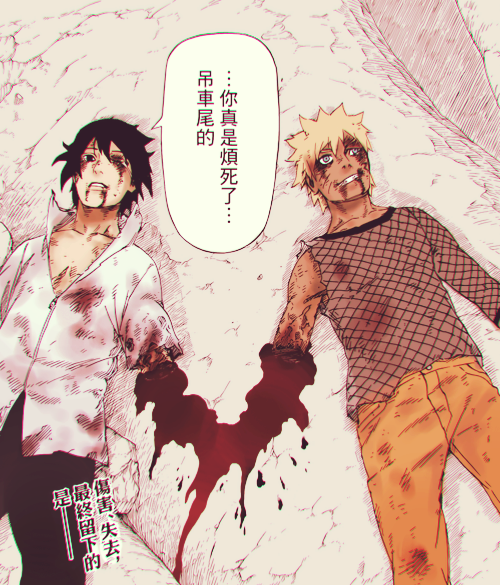 It was just too unfortunate that Naruto and Sasuke lost one of their arms, but I think it was also very symbolic. The blood that gushed out of their severed arms was linked together, as if representing the strong bond that held them through their ventures. Kakashi became the sixth Hokage, and everything turned back to normal. Sasuke was pardoned for his previous sins, but he chose to continue traveling the world as he took his road to redemption. He flicked Sakura on her forehead, and that action was enough to melt my heart. I am not a big fan of any pairings, but I must admit that that scene was touching. But what’s even more touching was the last part where Naruto met Sasuke before the latter began his journey. He already returned Sasuke’s forehead protector that was left after their first big fight at the Valley of the End. That panel could have been the best ending for this series, as it provided a sense of closure between the rivalry and friendship of Naruto and Sasuke. The only missing part would be the inauguration of Naruto as the Hokage, which I thought would never happen since the trailers of the upcoming movie only showed Kakashi as the Hokage. I would totally flip out if Kishimoto didn’t let Naruto achieve his other dream that he also chased for the last 15 years. And speaking of Karin, a lot of other characters were not shown in the finale. Team Taka and Yamato (oh my poor Yamato! ), for instance, did not exist in any panels. I pity Yamato since he had been gone throughout the most parts of the Fourth Shinobi War, and he was only briefly shown again after Infinite Tsukuyomi was dissolved. How great it would be if he was shown chatting together with Kakashi and Gai! Chapter 700 was probably just fine for most fans, and it was actually okay for me, too. I was only expecting it to be far better than that. After all, I didn’t wait every week for a new chapter for so many years to get a plain ending like that. Naruto finally fulfilling his dream of becoming a Hokage. Temari and Shikamaru with their son, Shikadai. I ship these two more than the other OTPs in the series. So their pairing is fine with me. Sasuke with his Madara hairstyle. Nuff said. Kakashi and Gai casually talking with each other. Just like the old times. Everyone matured really well in terms of their physical appearance. Aside from those, the whole chapter itself was nothing special, much to my disappointment. It didn’t reach my expectations. Chapter 699 would have been a better ending for the manga’s 15-year run. But I am not a critic or something. I am just a mere fan. And as a fan who grew up together with the characters in this series, I cannot convey my feelings now that it already concluded. I laughed at their antics and stupidity. I cried at their deaths and pain. I got annoyed and fell in love with each of them. I imagined myself living with them. I waited anxiously every week for what was going to happen next. I endured watching all the fillers in the anime. But now, I don’t have anything else to look forward to every week. And that thought makes me sad. It has been a long and rough journey, but it was worth reaching the end. After 15 years, Naruto, Sakura and Sasuke, together with their friends and other shinobi, have finally grown up. And I am proud to say that I grew up with them. So I would like to extend my heartfelt gratitude to Masashi Kishimoto-sensei and to everyone who was behind the creation and production of Naruto. It has been a wonderful roller coaster ride, and I wouldn’t mind riding it again in the future. I am looking forward to the upcoming spin-off series next year. But for now, let me just reread the manga from the very start, だってばよ! Posted in Manga and tagged haruno Sakura, Hatake Kakashi, Konoha, manga, Masashi Kishimoto, Naruto, Naruto manga, Naruto's ending, personal, Sasuke, spoilers, Uchiha Sasuke, Uzumaki Naruto. Bookmark the permalink. Team 7 finally reunites as Sakura and Kakashi find Naruto and Sasuke at the Valley of the End. Sasuke apologizes to Sakura as she stops the bleeding of their severed arms. Once healed, Naruto and Sasuke begin to dissolve Infinite Tsukuyomi and free all the shinobi who were put under the genjutsu. Sasuke recalls everything that he has been to and tells Naruto how he can finally understand what he wanted to convey to him all along. He notes how they had to live without their families and survive all by themselves in a world full of hate, and how Naruto continued to approach him even though he almost destroyed their friendship. When everything has finally settled down, Kakashi has been proclaimed as the new Hokage. Sasuke leaves the village once again after Kakashi warns him not to do anything crazy just like before after he was pardoned from his crimes. Sasuke tells them that he wants to look at the world once more as he takes his road to redemption. Sakura tries to come with him, but he objects and instead, flicks her on her forehead, just like what his brother Itachi had done to him in the past. He bids good bye as he thanks her and both Sakura and Kakashi see him off. Naruto meets Sasuke while the latter is on his way to his journey. They strike a short conversation, as Naruto returns Sasuke’s forehead protector to him. The bond between them has just been reaffirmed, as they continue to traverse their path and move forward, as they are the shinobi that are entrusted with hope. Posted in Manga and tagged chapter 699, haruno Sakura, Hatake Kakashi, manga, Naruto, Naruto Chapter 699: The Seal of Reconciliation, Sasuke, The Seal of Reconciliation, Uchiha Sasuke, Uzumaki Naruto. Bookmark the permalink. Another teaser about the upcoming Naruto movie has been released! 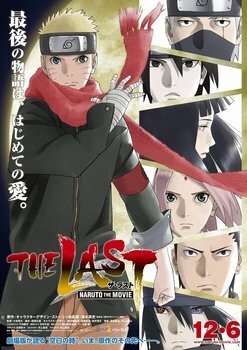 “The Last: Naruto the Movie” is scheduled to premiere in Japan on December 6 as the tenth overall Naruto film, two years after Naruto the Movie: Road to Ninja was released. Masashi Kishimoto himself is taking part in the film’s story concept and character designs, while Tsuneo Kobayashi is directing it. The film is also part of the “Naruto Shin Jidai Kaimaku Project” (Naruto’s New Era Opening Project) marking the 15th anniversary of the manga. Jun Fukuyama is joining the cast of the movie as Toneri Ōtsutsuki, a descendant of the Ōtsutsuki bloodline. The story takes place years after the Fourth Shinobi War, and as the moon threatens to crumble and destroy the Earth, a mysterious man abducts Hanabi Hyuga. Naruto, together with his friends, must save Hinata’s younger sister in their final battle that will decide their fate. 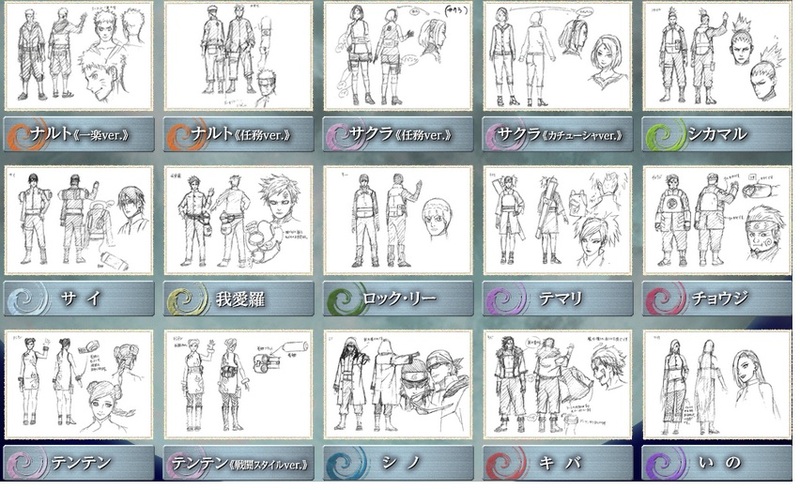 A 32-second teaser was revealed in July which showed Naruto with his new looks. And to hype things up, a second teaser has been released which shows the rest of the characters such as Sai, Shikamaru, Hinata, Sasuke, Gaara and Kakashi. Are you excited to see the new movie? Coz I definitely AM! Check out the official website of the movie here! Posted in Movie and tagged Battousai, gaara, Hatake Kakashi, Hinata, Hyuga Hanabi, Hyuga Hinata, Kakashi, movie teaser, Naruto, Naruto Shin Jidai Kaimaku Project, Naruto's New Era Opening Project, Sasuke, Shikamaru, teaser, The Last: Naruto the Movie, The Last: Naruto the Movie teaser, Toneri Otsutsuki, trailer, Uchiha Sasuke, Uzumaki Naruto. Bookmark the permalink. Naruto and Sasuke’s fight has finally come to an end. Both of them use their remaining chakra to deliver their final blow to each other. Sasuke uses kagutsuchi while Naruto attacks him with rasengan using the last bit of chakra Kurama gave him. The final assault causes both of them to lose consciousness and they both wake up later to find themselves lying side by side. They can’t move that much since they might bleed to death, with their arms getting severed from their earlier clash. Once again, Sasuke asks Naruto why he would risk everything just to save him from darkness. As his best friend, Naruto explains to him that he can also feel the pain and burden he carries. Sasuke recollects the past as he remembers how Naruto and the rest of Team 7 remind him of his own family. And how, just like Naruto, he could also relate to his suffering that caused him to create a bond with him. But at the same time, that feeling turned to envy when he saw how Naruto grew stronger than him. Sasuke’s recollection of the past comes to a halt when they both fall asleep again. The next morning, as they both wake up, Sasuke finally admits his defeat with a smile on his face as he acknowledges his rival. Surprised, Naruto tells him that there are no winners or losers in their fight, because he just merely wants to make his friend realize the wrong path he wanted to take. Sasuke tells Naruto that if he dies, Naruto can just dissolve the Infinite Tsukuyomi by transplanting his left eye to Kakashi. Naruto stops him from sprouting nonsense as if he is about to die and tells him that he only wants to unite all shinobi including him. Sasuke asks him how he can be certain that he will not come after him again, but before Naruto can provide an explanation, he sees the profile of Sasuke…in tears. This chapter was just too much for me to handle. The bond between these two has seeped in to the very depths of my otaku soul. After all those years, only the two of them could relate to each other’s feelings. Seeing Sasuke shed tears after all the villainous deeds he made in the previous chapters, somehow, made my heart break into pieces. I think it’s now safe to assume that Naruto succeeded in saving his friend from falling into the pit of darkness. Even without their arms, their blood is still linked which symbolizes the strong bond between them. *sighs* Naruto and Sasuke, you just don’t know how the fandom is drowning in feels right now. Posted in Manga and tagged chapter 698, feels, Kurama, manga, NaruSasu, Naruto, Naruto Chapter 698, Naruto Chapter 698: Naruto and Sasuke 5, Sasuke, Uchiha Sasuke, Uzumaki Naruto. Bookmark the permalink. 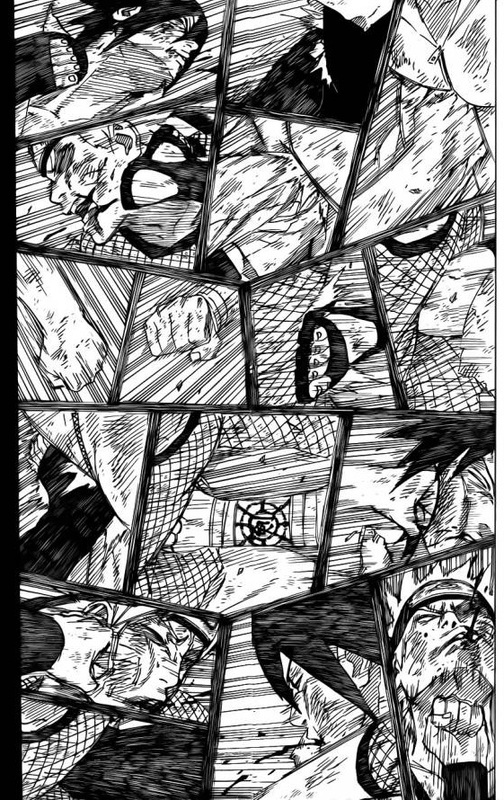 The final battle between Naruto and Sasuke ensues. The war between them has started since Chapter 694, and I swear, I was almost at my limit with the recent development of the series. I didn’t want the manga to end with just the two of them clinching all the panels by themselves. Fortunately, tonight’s chapter is much better than the previous one. Sakura and Kakashi somehow manage to squeeze some panels for themselves as Sakura finally wakes up from the genjutsu that Sasuke cast on her. She asks Kakashi about her teammates, and he tells her about the two settling their scores at the moment. After the long struggle, the two seem to be exhausted (at last) after Sasuke assaults Naruto with his most powerful technique. The impact from Indra’s Arrow sends the two of them plummeting to the ground. They continue to strike each other using every bit of their remaining energy, with their emotions surging and passing through their attacks. Kurama tries to give some of his chakra to Naruto, but to their surprise, Sasuke manages to absorb it thanks to the power of his Rinnegan. This allows him to charge his chidori and confront Naruto. Sasuke then bids farewell to him as he readies himself to deliver his final blow to his only friend. Posted in Manga and tagged haruno Sakura, Hatake Kakashi, Kurama, Kyuubi, manga, Naruto, Naruto and Sasuke Part 4, Naruto Chapter 697, rinnegan, Sasuke, Uchiha Sasuke, Uzumaki Naruto. Bookmark the permalink. This chapter is basically about the battle between Naruto and Sasuke. There aren’t a lot of words spoken but you can still feel the bond between them. As they continue to fight each other, their memories of their childhood and their friendship as well as their struggles return. They share the same fate and the same pain, as they both grew up without their families. But Sasuke decides to lurk in darkness, while Naruto tries to bring him back to light. With his Susano’o, Sasuke fights Naruto in his tailed-beast mode. They both seem to completely understand the reason why they have to battle each other. But Naruto has already vowed that he will not let Sasuke kill him, because he doesn’t want his best friend to be alone again. Dying is not an option for him, and there is no way he’d leave Sasuke in solitude just like before. Argh. The countdown has definitely started. This is the first chapter that was released after the announcement regarding the end of the manga’s serialization was made. Somehow, I felt quite disappointed with all the panels that were wasted in the recent chapter. Kishimoto-sensei could have curtailed the part where the memories were shown to save more panels and used them instead for much more significant scenes. I mean, there are only a few more chapters left so we can’t afford to see the panels being used for some petty matters. But don’t get me wrong; I also drowned in their bromance here, so I wasn’t totally dismayed with last night’s chapter. I hope the next one would give us a more conclusive scenario not just about these two but also to the other characters as well. Posted in Manga and tagged chapter 695, manga, Naruto, Naruto and Sasuke Part 2, Naruto Chapter 695: Naruto and Sasuke Part 2, Naruto Shippuden, Sasuke, spoilers, summary, Uchiha Sasuke, Uzumaki Naruto. Bookmark the permalink.